July has been a very busy month with the sun out and all. The beautiful weather always gets the best of me and before I know it another day has passed and I have little to show for my time. I love the long, warm days where I can twiddle away my time in my garden and take long drives to farmer’s markets and what not. I do wish these days of summer could last. So, what happens in my art goals is that I get stuff done, but don’t take the normal amount of care documenting. I also tend to let my Morning Pages slide quite a bit. This month also seemed to be packed with lots of projects as well including finally launching Michelle Quesada – Mused Art (my artist page). So Saturday morning came and I noticed it was the LAST weekend in July and knew that I was running out of time to get my Artist’s Date in for July. Imagine my excitement when I saw that Shiloh Sophia was offering a same day class called Being Abundance. I have long learned that abundance is a state of being–as well as a fleeting state at times. 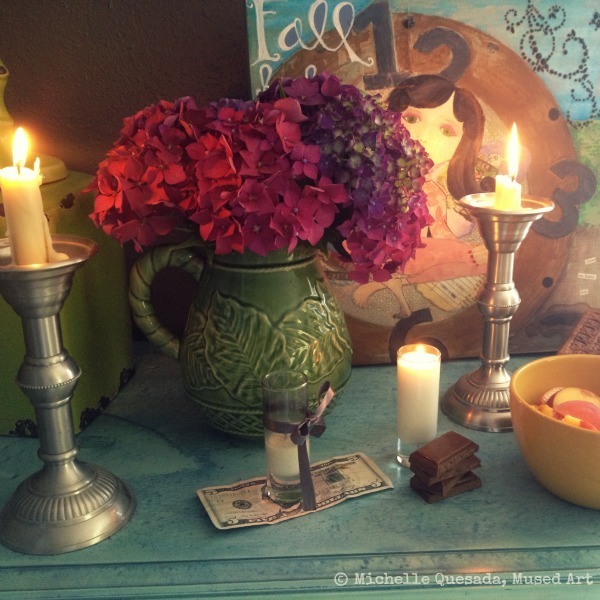 I had just enough time to get down to make a few stops to pick up a few essential items to create an abundance alter before her class began (candles, chocolate, peaches, and flowers). I already had the other listed items for making the painting. I happen to be a huge fan of her style of art which she says she uses a style of Jungian-Shamanism or Visioning-Imagination. This really means that you search for meaningful symbols through guided meditative journeying. It truly leads to beautiful and meaningful art pieces. I had taken a class from her before and found her process fruitful. Although the six hour class had several breaks (including lunch), she taught it live and walked the students through a painting from start to finish. In this type of process, she is the guide to assist you in connecting with your own answers. I think this is what I really love about the philosophy that she uses. There was journaling, processing, letter writing, medication, prayer, and symbol identification. At the end of the day, you came away uplifted as well as with a beautiful symbolic painting of your own. 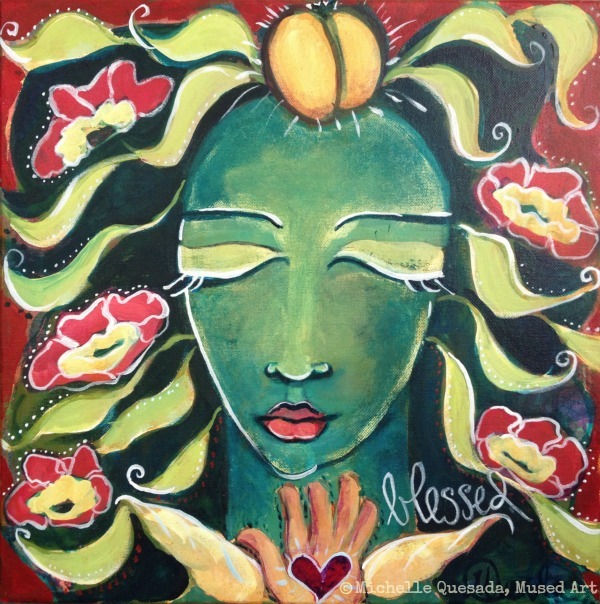 I received several symbols some of which were included in my painting of my lady of abundance. I realized that the message that I heard was that I am blessed and that I only need to open my awareness to the beauty all around me. This was by far one of my favorite Artist’s Dates so far this year! What has really struck me is that there are so many opportunities that would have never been possible a few years back due to the world wide web. How lucky are we all to be able to have access to talented artists such as Shiloh Sophia and so many others! What a beautiful day and productive class for only $47! I will be heading back for more of her teaching! This entry was posted in Artist's Date, I'm Doing The Artist's Way in 2013, Morning Pages and tagged abundance, art, blessings, creativity, painting, the artist's date. Bookmark the permalink.